This Japanese cast iron pot nabe can be used for making a variety of one pot dishes such as yosenabe, nabeyaki udon, sukiyaki and oden. Can be used directly on a flame to cook. 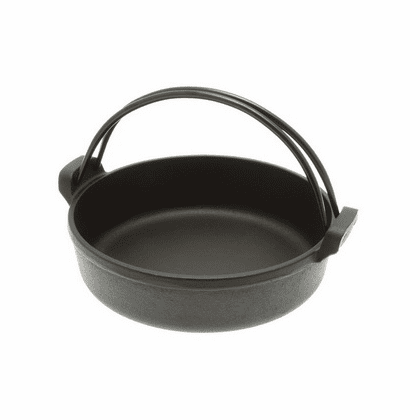 This Iwachu cast iron sukiyaki pan is durable and retains heat well. Double handles fold flat for easy storage. Handles become very hot. Always use proper potholder or glove when handling. Allow pan to cool before washing. Clean the pan with hot water and heat it to dry. Store in a dry place. Do not expose it to salt.